The Recovery Opportunity Center/RI has posted their Certified Peer Specialist and Supervisor trainings for 2015. The first Certified Peer Specialist Training will be held January 5-16, 2015 at Philhaven in Lebanon, PA and the first Supervisor training will be held January 20-21, 2015 at Philhaven in Lebanon, PA.
For more details and registration applications, visit the Certified Peer Specialist job listing page on the PMHCA website. For more job listings, visit the Job Bank on the PMHCA website. If you are an employer in the behavioral health community and have a position available in Pennsylvania, PMHCA will post the job on this website and include it in an email to our membership. Send job title, description, contact information and any other details to us at pmhca@pmhca.org. Make the Connection, website is a public awareness campaign by the U.S. Department of Veterans Affairs that provides personal testimonials and resources to help Veterans discover ways to improve their lives. Many of our Nation’s Veterans, from those who served in World War II to those involved in current conflicts, return not only with physical wounds but also mental health issues they may not recognize. The Make the Connection campaign encourages Veterans and their families to “make the connection”- with information and resources, with the strength and resilience of Veterans like themselves, with other people, and with available sources of support including mental health treatments. Veterans and their families and friends can privately explore information about physical and mental health symptoms, challenging life events, and mental health conditions. On this site, Veterans and their families and friends can learn about available resources and support. Visit Make the Connection to learn more about the resources and connections available for Veterans. 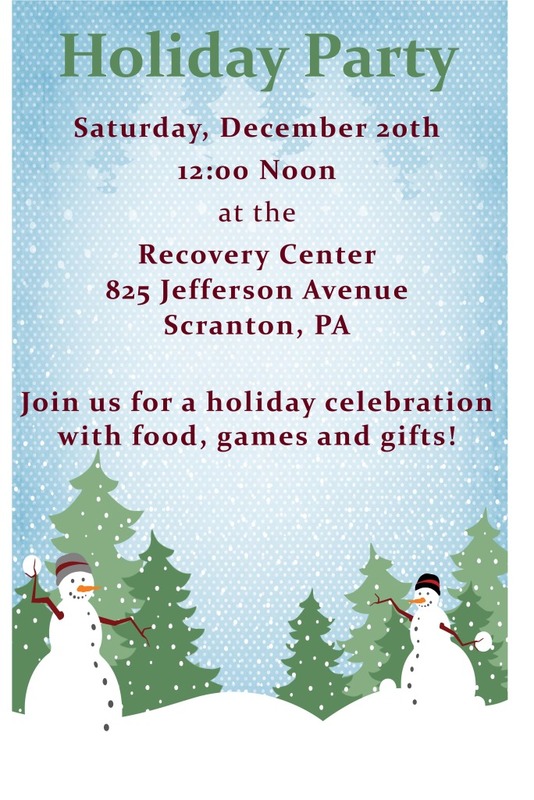 Recovery Center to host a Holiday Party on December 20th!